This news item was posted in A, S, Shoulder category and has 0 Comments so far. The shoulder joint includes 3 bones: the clavicle (collarbone), the scapula (shoulder blade), and the humerus (upper arm bone) with two joints. These joints are the acromioclavicular (AC) joint and the glenohumeral joint which is the traditional “ball-and-socket” that allows complete range of motion. The bones of the shoulder are held together by muscles, tendons, and ligaments. Tendons (tough cords of tissue that attach the shoulder muscles to bone) and ligaments (attach bones to bones) provide additional strength and stability. The rotator cuff muscles hold the ‘ball’ in the ‘socket’ and provide mobility and strength to the shoulder joint. Two bursae cushion and protect the rotator cuff from the bony arch of the acromion and allow smooth movement of the joint. 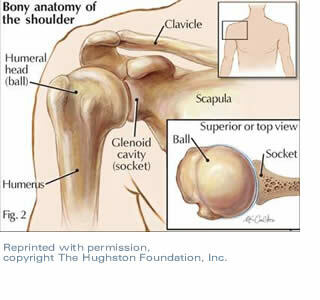 The shoulder is the most movable joint in the body, and is very unstable. It is easily injured by impact or simple overuse.